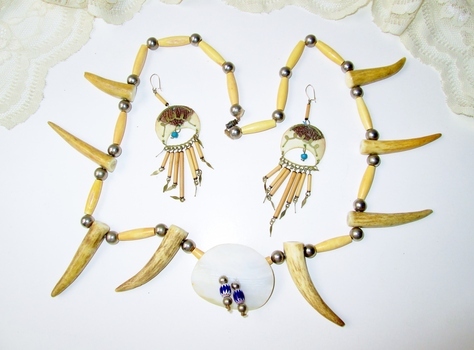 Elk Antler Necklace & Bamboo Earring Set handmade one of a kind Boho Native Tribal jewelry set. Necklace 30" long unclasped. Screw together clasp, bamboo and antler slice dangle earrings pierced type hook. This is a vintage set in great condition and very unique. Great for a very unique gift anytime.